· Used mainly in the leakage test of all kinds of automobile sealing parts, such as cylinder block and head, gearbox casing, braking parts, cooling system assemblies, air reservoir and axle housing. 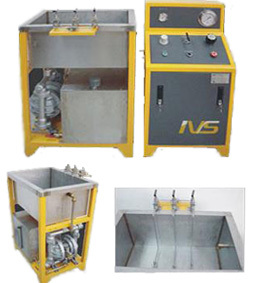 · Extensively used in auto parts production plant, product quality testing/inspection, research institutions and other units of various automobile parts production testing/inspeciton, R&D. ·Fully automated test stand with high speed data acquisition system. · History screen and real-time display of pressure-time curves. · Test data saved automatically when emergency or power down happens accidently. · Wide range of testing pressure from 5Kpa-5Mpa. · Stable and reliable IVS-Test Software features easy operation and user-friendly interface.